Full details of the government's Brexit "backstop" proposal are to be outlined on Thursday amid a row over the planned length of any stop-gap arrangement.Downing Street will outline plans for a "temporary customs arrangement" with the EU should no permanent solution be agreed before the UK's 2019 exit.BBC political editor Laura Kuenssberg said it might not specify an end date.But Brexit Secretary David Davis said he "expected" there to be a time limit in the signed-off version of the plan. Speaking in London, Mr Davis said the details had yet to be approved and said he believed Thursday's meeting of the cabinet's Brexit sub-committee would be "decisive". No 10 says it does not believe the contingency plan will ever come into effect because a customs arrangement - seen as vital to preventing a hard border between Northern Ireland and the Republic of Ireland - would be agreed as part of the overall withdrawal deal.Sources in Brussels have told BBC Europe editor Katya Adler that Mr Davis will go to Brussels on Monday after requesting an "informal" meeting with his EU counterpart, Michael Barnier. The UK has said it will leave the EU's customs union but has yet to agree on what will replace it amid cabinet divisions over the two options being considered by ministers. The UK and the EU are still trying to agree a long-term customs deal on how trade in goods will operate after Brexit - but they have agreed that a "backstop" option is needed in case no deal is done, to avoid the return of a hard border between Northern Ireland and the Republic of Ireland.The UK has said that the EU's proposed backstop option would effectively create a border between Northern Ireland and the rest of the UK and was not acceptable. Instead, the UK is proposing a "backstop" option which will see the UK temporarily aligned with the EU's customs union after December 2020 - when the 21-month post-Brexit transition period ends. 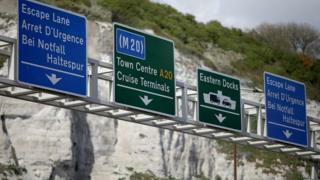 The plan, which Theresa May has said would only apply in a "limited set of circumstances", would see the UK match EU tariffs in order to avoid border checks and allow it to sign and implement its own trade deals. The BBC understands the plan circulated among some ministers on Wednesday morning refers explicitly to the whole of the UK rather than just to Northern Ireland.BBC political editor Laura Kuenssberg said she understood it would involve the UK having to "respect the remit" of the European Court of Justice and interpret EU laws and directives "consistently" - terms likely to anger Tory MPs who want a clean break with the EU and the ability to diverge economically after the end of the transition phase. She said she had been told it was not clear the proposal as it stands will go to the European Commission in the run-up to a crucial summit later this month amid concerns it was vague and, according to one source, risked "other people putting words in our mouths". She said one source described the plan as a "Hotel California" scenario where the UK never fully leaves the EU while another said it avoided the UK crystallising its decisions on what it wanted from the Brexit process. Downing Street said the proposals would be published "shortly" and would include a time limit but declined to give further details.Former Northern Ireland Secretary Theresa Villiers, who backed Leave in the 2016 referendum, said she and other colleagues did not want to see the UK "locked indefinitely" in a situation where it had to accept EU rules and hoped the timing would be clarified as soon as possible. In a speech in London, Brexit Secretary David Davis said there was no question of the UK accepting "membership-lite" or having to choose between existing Norway or Canada models of co-operation. While the UK would continue to contribute to certain EU programmes and abide by related European Court of Justice rulings in those areas, he said the EU must in return recognise the UK's "sovereign legal order".And he also warned the EU they were "shooting themselves in the foot" if they blocked the UK from taking part in the Galileo sat-nav system after Brexit. Pressed on the issue at Prime Minister's Questions, Theresa May insisted the UK was on track to leave the EU in March 2019 and that the transition period would last no longer than 31 December 2020. Separately, the government has said it is treating a warning by the Dutch government to its country's manufacturers to avoid British components as an "extremely high priority".